You are looking for the perfect holiday? Spend a relaxing spa vacation or a sportive holidays in Gastein. The glorious mountain peaks and lush alpine meadows await you. Experience all this and much more in your holidays in the Gastein Valley! Give yourself and your family an unforgettable time together. Blue skies over mountain slopes covered deep in snow, wisps of smoke rising up from the chimney of a rustic ski lodge. The jingling of bells on a horse-drawn sleigh, soothing relaxation in hot spring waters. This dream has a name: Gastein! Bad Hofgastein is a market town and the historical hub of the Gastein Valley, located in the sunniest and broadest point of the valley. Its centre is surrounded by the pedestrian precinct, beautiful shops, hotels and restaurants, as well as by the big Kurpark. Experience a broad range of sporting opportunities, both in summer and winter! 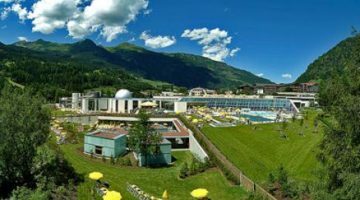 Bad Hofgastein has succeeded quite elegantly in harmoniously integrating its appealing architecture with the natural setting. Look out of your window and enjoy the wonderful landscapes of Gastein’s mountain world! But don’t just take our word for it! Take a look through our panorama camera or explore Bad Hofgastein on your own with the aid of our street map. Only 3 minutes walk from the campsite!